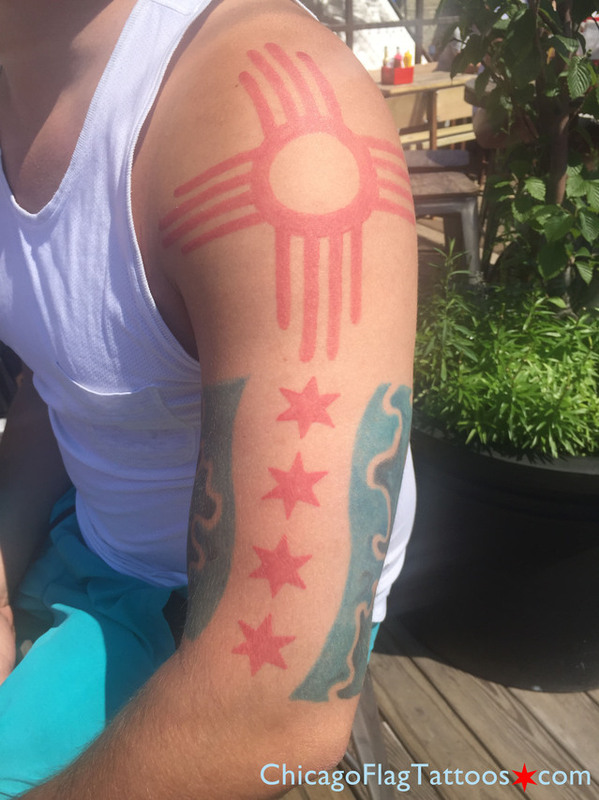 I ran into Chris at Twisted Spoke and asked him a few quick questions about his bold Southwest-flavored Chicago flag tattoo. CFT: Is that a New Mexico Sun? Chris: It is. I was born there. 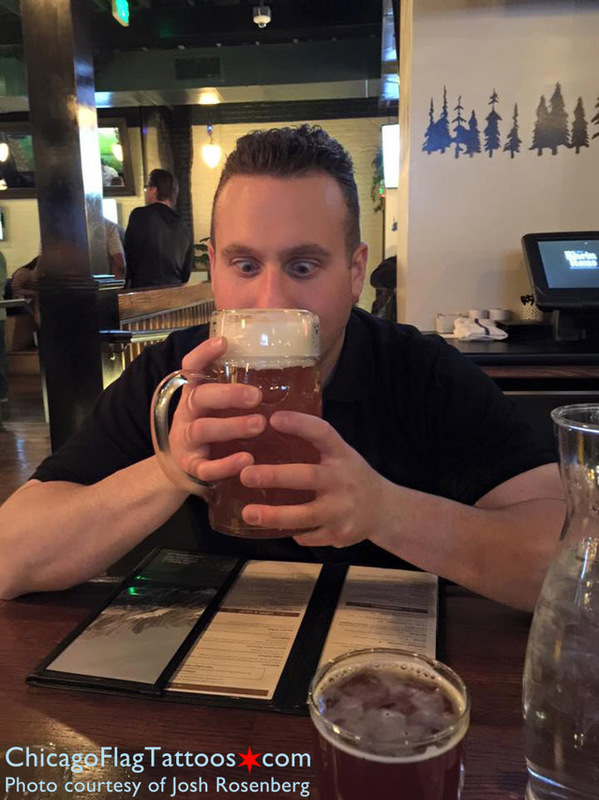 CFT: How long have you been in Chicago? Chris: Just over twelve years. CFT: What made you decide to incorporate the two? Is the water also symbolic of other places? Chris: No, this [the blue shapes] is just abstract. Definitely everyone thinks it’s water. I just wanted some abstract blue there. It’s just the two places that feel like home to me and made me the way I am. CFT: Where did you get it done? 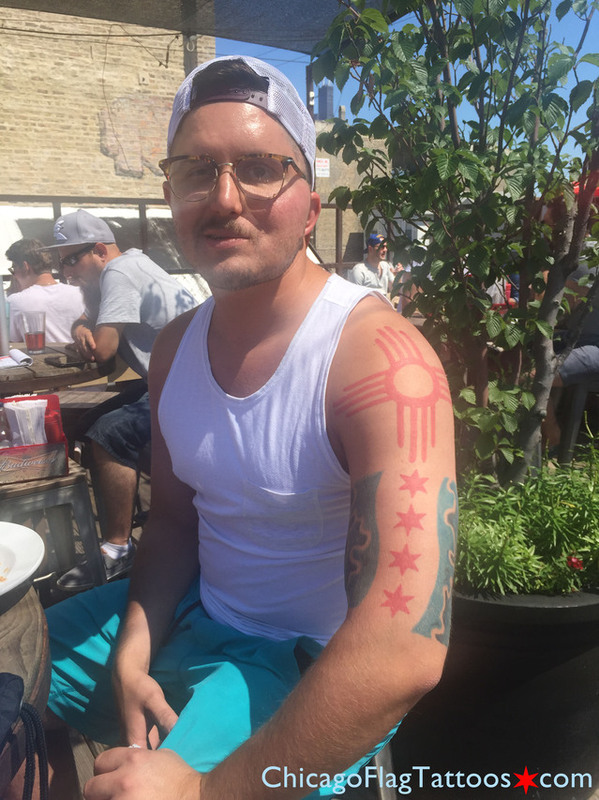 Chris: I got it done at Uptown Tattoo Factory. I’m stationed in Japan with the USN and I’ve been getting homesick more and more every day. 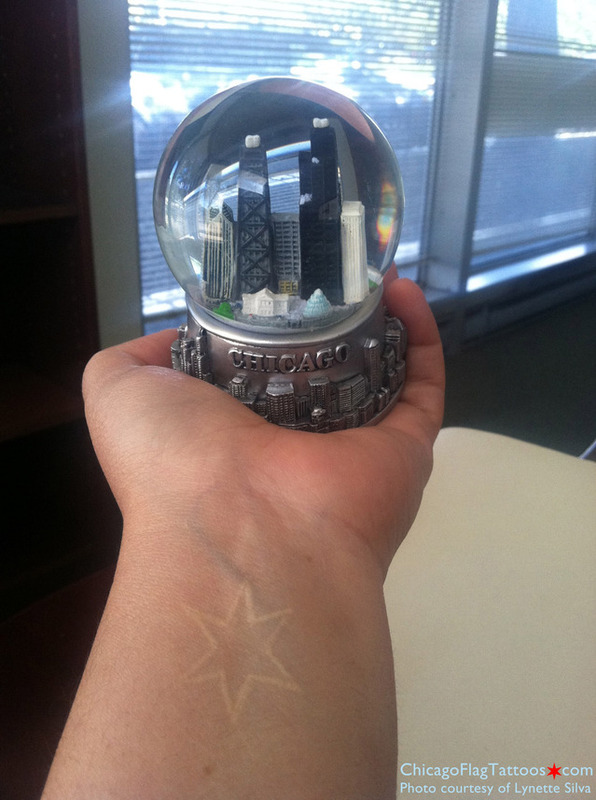 So I decided to show my love for the city and get this tattoo so I could feel closer to home. I got it at a shop called Boobies in Okinawa, Japan on April 6th 2017. I don’t remember the artists name though. I was born in Round Lake IL, in Lake County. Obviously when you tell people that they have no clue what you’re talking about, so I find it easier to just say Chicago, plus I’ve always seemed to feel more at home amongst the pace of the city. October 1st will be my 5th year in the Navy and officially the end of my contract. After that I’m hoping to get accepted at N.I.U. and/or get a job serving the community. Chicago is everything to me, from the food to the music. What other city can lay claims to Chance the Rapper, Kanye West, Jennifer Hudson, R. Kelly, Nat King Cole, Alkaline Trio, or even Styx? We even have ties to Soundgarden and blink-182! That’s just the music scene, and not even half of it. If you think our Hip-Hop scene is big, you should just look at our Rock history. The Buckinghams, Chicago, Earth Wind & Fire, Cheap Trick, Ministry, Smashing Pumpkins, Disturbed, OK GO, Plain White T’s, Rise Against and Fall Out Boy! Stop me if I’ve said too much. We got deep dish, Lake Michigan, The Loop, Al Capone, The Taste of Chicago, Pride every June, The Sear’s Tower, Lincolin Park, amazing museums and nobody does St. Patty’s like we do! 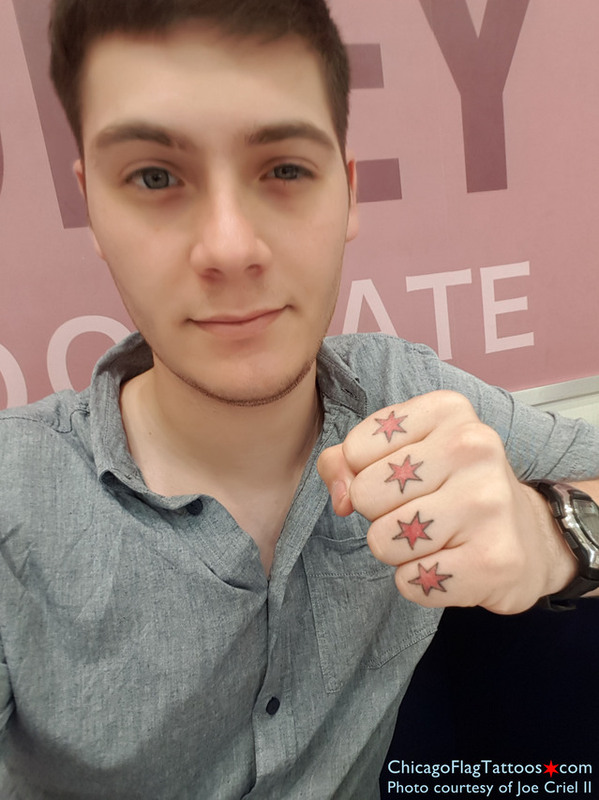 Every few days somebody will ask me what the stars represent, one guy asked me why I had so many “Stars of David” on my knuckles. I always love telling them where they are from and the what each star represents to our great city and the history behind it. They say I’m too proud of Chicago, I say there is no such thing. What I love more than telling people about the stars is finding fellow Chicagoans, which is pretty rare, and getting to talk to them about what kind of experiences they had growing up and what brought them into the military. So far, I’ve only had one person who was not from Illinois recognize the stars, but I’m convinced it’s because he was stationed in Great Lakes for a while. You are more than welcome to publish my name, Joe S. Criel II, as well as quote as much as you’d like. 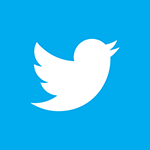 I’m sorry if I said too much, I tend to ramble when I’m excited or passionate about something. We love excitement and passion around here, Joe 2, so rock on! 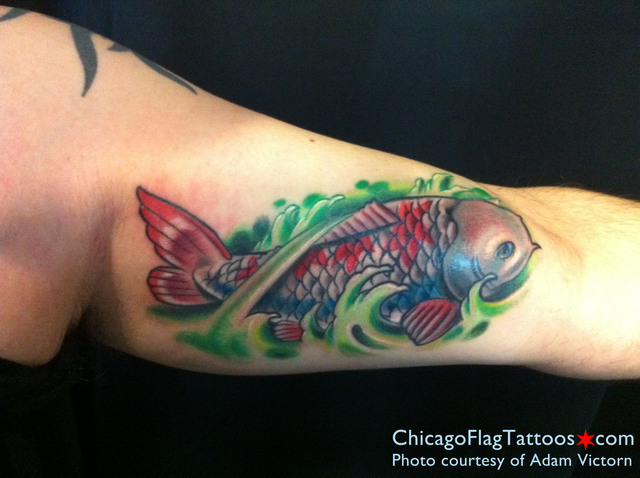 My name is Adam Victorn and my tattoo is a Koi fish with a Chicago flag in the scales. It was done by Pony Lawson of Mayday Tattoo Co. 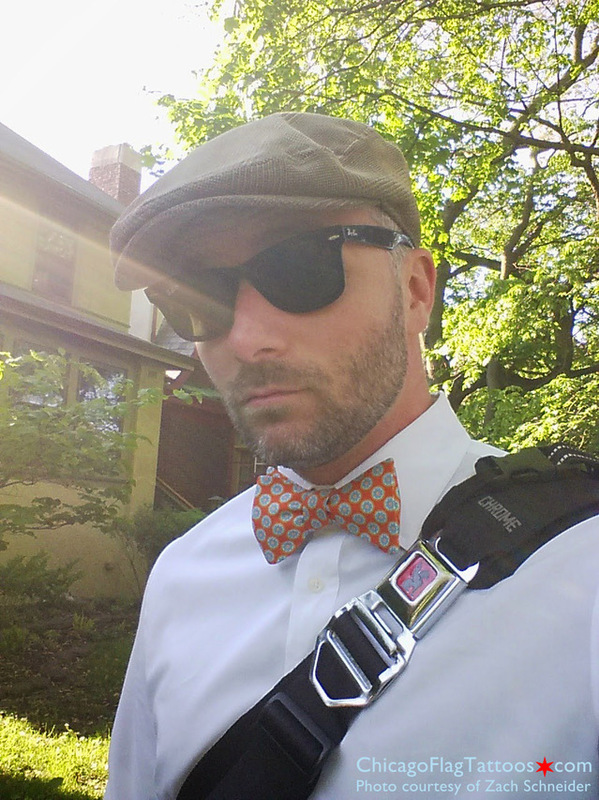 I was born and raised in the suburbs of Chicago. Chicago has always felt like home and no matter where I go or what I do, that won’t ever change. It has an incredibly special place in my heart. My koi fish symbolizes always moving up-stream and forward in life, but never forgetting where you come from. Lynette writes in with our first snowglobe! I was sitting in my office, feeling homesick. Your website gave me a little Chicago fix that I needed desperately! 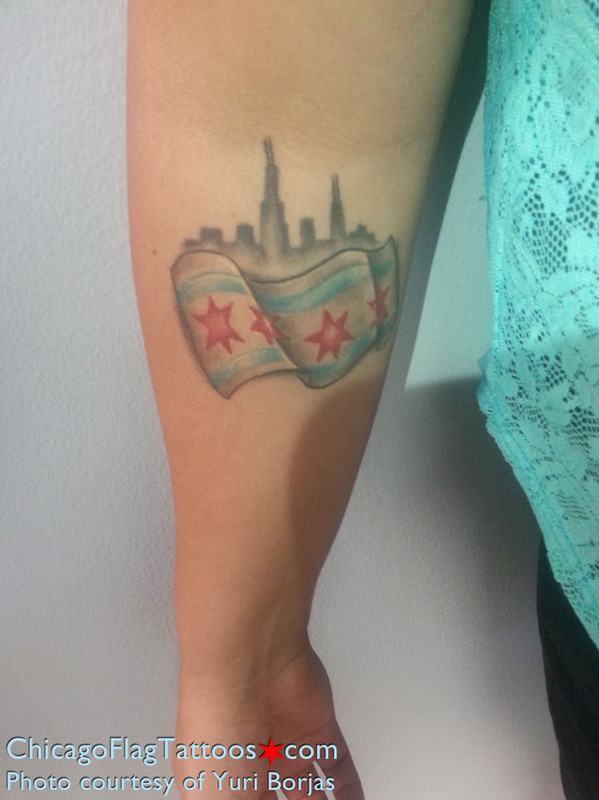 When I knew I would have to leave, I wanted to make sure I would always have Chicago with me in some way. So I got this white tattoo of one of the stars from the flag. Specifically, the star representing the great fire. 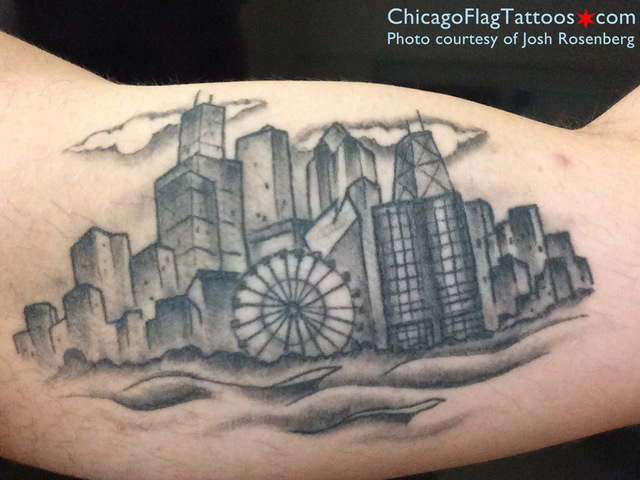 I was born and raised in the area and Chicago has always had a very special place in my heart. 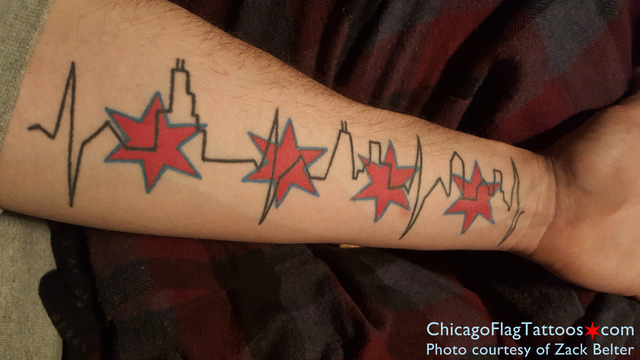 Clearly my tattoo is not an exact picture of the skyline, but is more of a representation of all the places that hold happy memories to me. When I was a kid, my mom and I never had much, but she would always take me to Navy Pier. We would ride the ferris wheel, and ride the boats where I always saw the skyline. My uncle used to live in Lake Point Tower, where I would watch the fireworks over the city during the summer nights. The Sears (never Willis!) tower and Hancock building always gave me the goosebumps when I drove back home from the airport whenever I visited home. I’m currently in the Army and find myself deployed overseas quite often. Whenever I get up in the morning and look in the mirror, I always have a sense of home. 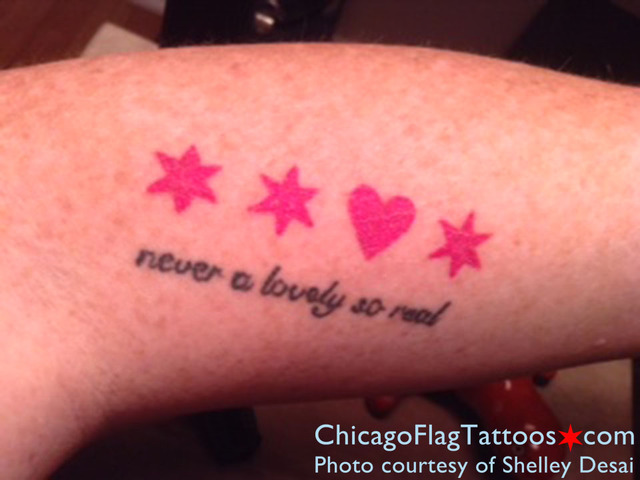 The tattoo was done a couple months ago at Tatu Tattoo in Wicker Park by Eric Janovsky. I moved to Chicago in 2002 and I now feel that I can call Chicago home. I also ride in the streets of Chicago year around. 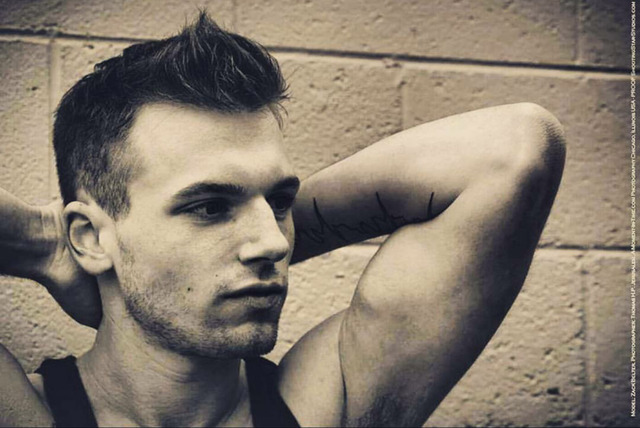 Zach’s tattoo is by Gordon Lipari, at the time at Metamorph. 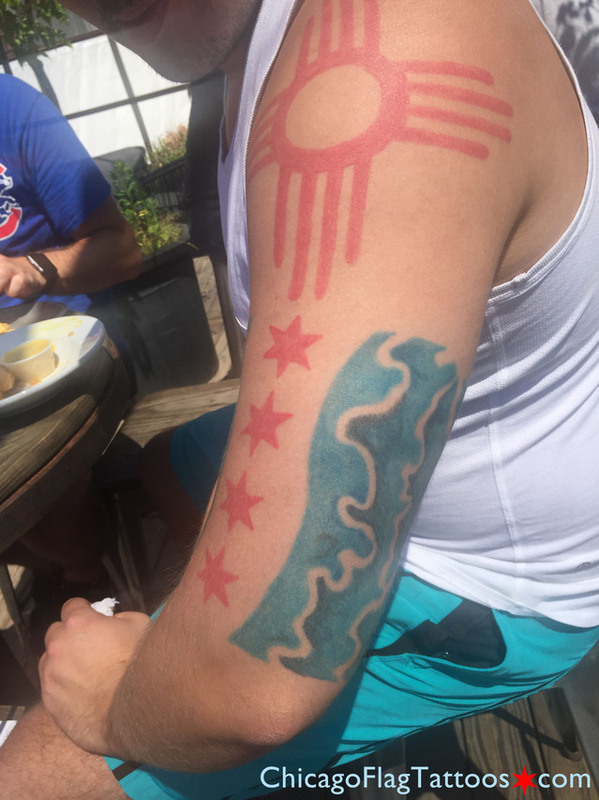 Here is a picture of my Chicago Flag Tattoo! Born and raised. Anyone who was born a Chicagoan knows, we have tough blood. We don’t break. My name is Yuri, I’m a 22 year old female. You have great neighbors that stick together. You see all the local kids getting together to play kick ball in the middle of the one way street, or in the alley playing basketball ball with a net made of a milk crate. Where the corn man comes around and all the kids taking change out of their sock. When you’re a little older you get your bikes and race around the area cause your parents finally let you off the block. Having to be inside once the street lights came on. Finally, you’re of drinking age. Going to all the big festivals downtown. Taste of Chicago, Blues Fest, Beer Fest, all the festival parades. Including celebrating our Chicago team winning! Meeting up with family to go the zoo. Going to the North Ave Beach, and meeting tons of people your age, playing football in the water, volleyball on the sand. Bike riding down the Lake Shore Drive strip. Crossing the street during rush hour. Eating Chicago stuffed pizza, or Chicago style hot dogs. Maxing out at Jim’s Original, over by UIC. The CTA, taking the Loop. The Orange line, meeting strange people. Knowing you’re getting closer to the city. Being able to see the sky line getting closer. Taking the subway, and losing cell service, so you can’t help but stare at people or listen to their conversation. And being a Bears fan, when they’re only good. Going to all the museums, relearning things you did when you were excited to go on a field trip back in middle school. Going to local thrift stores and realizing, some of this stuff you want might be something you have already had and donated once. Oh, how could I forget… Chicago, the one place where get all four seasons in one day. Moved to Portland, OR from our home town of Chicago. 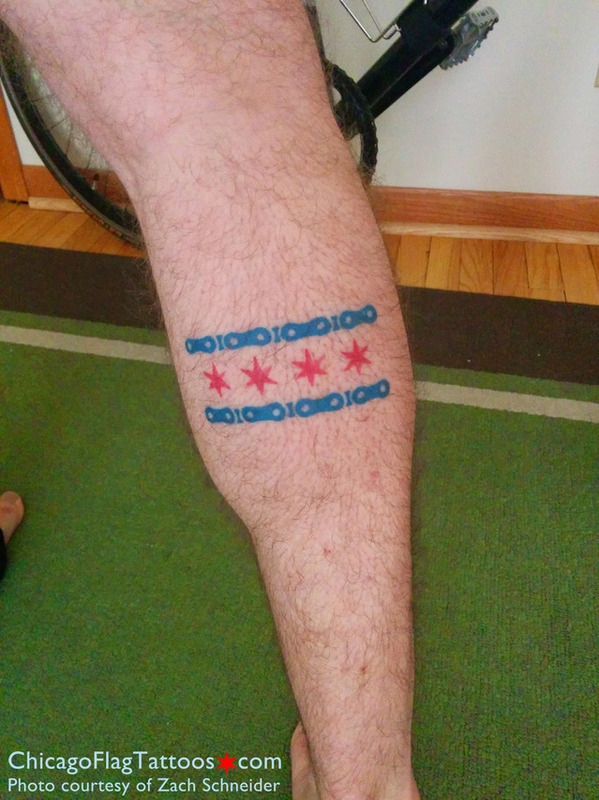 Needed to memorialize my love for our fair city! So I got this tattoo before leaving. The quote is from the Nelson Algren essay, Chicago: A City on the Make. The tattoo done by Robert at Native Soul Tattoo on 17th and Ashland.